After quickly deciding that they would all go back to the hotel most of Demi&apos;s party were staying at - to decide their next plan of action - nobody said another word. What was there to say? It didn&apos;t look like the case was going in their favour at all. Dianna spent the whole trip crying. She blamed herself. This was all because of her bad relationship with her sister, after all. If she had done something differently, maybe tried to take custody of Kesha when her parents first took her away, perhaps they wouldn&apos;t be in this mess now. Silently, everybody filed out of their respective taxis. Demi had rode with Selena, Monica and Samantha, instead of her family. It wasn&apos;t that she didn&apos;t want to be with them, it was just that all eight of them - plus her lawyer - couldn&apos;t fit in one car, and Monica and Samantha made her feel closer to Kesha. All her family did was remind her of how Kesha used to be, when she was still Kessie. Hearing Dallas say that name in court had made her heart hurt. Demi left her dark glasses on as she entered the foyer. Her head was full of dark thoughts. Of Kesha alone, and herself locked away, unable to save her. The thoughts clogged up her throat, making her feel unable to voice her worries. "DEMI!" A voice screamed across the room. Demi&apos;s head snapped up. Her eyes immediately looking to the source of the noise, the bar. They rested on a blonde head of short hair, the person attached to it running quickly across the room towards her. "Marissa?" Demi choked out as she was engulfed in a strong hug by her best friend in the entire world. "Your here?" Tears spilled down both girls&apos; cheeks as they embraced tightly. "Of course I&apos;m here," Marissa laughed half-heartedly. "My flight got delayed, I was in LA so I wasn&apos;t on the same one as the others. I made your mom and Mads keep it a surprise." "I&apos;m so glad your here!" Demi cried through painful sobs. "I&apos;ve missed you." "I&apos;ve missed you too!" Marissa replied, holding Demi and rocking her gently. "How was court? You&apos;re obviously not arrested." "Not yet..." Demi mumbled, pulling away from Marissa so they could have a proper conversation. Their hands remained clasped tightly together. "It&apos;s in recession until tomorrow. Mar, it was horrible!" "Not now," Dianna interrupted, stepping forwards. "Lets all sit down in a booth at the restaurant and talk properly." The girls agreed, stepping back to let Dianna lead the way. Marissa quickly began her way around the group. 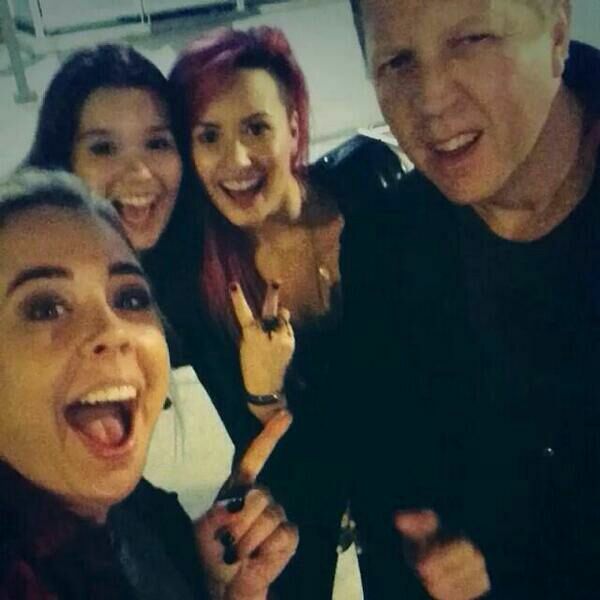 Greeting Demi&apos;s family like she was one of them - and, in a way, she was. Selena watched this happened with a growing out of resentment in her stomach. She remembered when it had been her greeting Demi&apos;s family like her own - she still called Demi&apos;s parents her aunt and uncle! But she had seen the way they looked back at her, felt the awkwardness in the air. They didn&apos;t really know each other anymore. But with Marissa nothing had changed. She was like another daughter. They all just seemed so familiar with each other. The whole thing just reminded Selena that she wasn&apos;t Demi&apos;s best friend anymore. She noted that Marissa was not only Demi&apos;s oldest friend now, but also her best friend. The thought made Selena feel sick. Made even worse when Marissa approached her. "Yep," Selena nodded awkwardly, popping out the &apos;P&apos;. They both shifted uncomfortably. "I guess you&apos;ve come to support Demi too?" Marissa smiled, trying to be positive that Selena was there. In reality, she resented Selena for dropping Demi the moment better, popular friends had shown up. And Selena knew it.